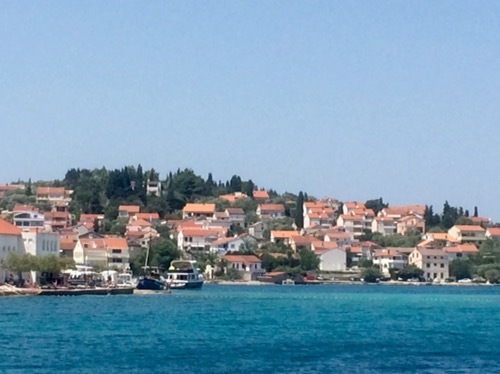 ← Welcome to Croatia – or possibly not! An early start on Sunday to make our way down towards Zadar in order to meet Ingrid and Jan Olav, Liz’s cousins on Tuesday. During the night the wind had got up to over 20 knots in the anchorage, which was fine for us but a number of boats dragged so we were awake for a couple of hours keeping an eye out. The motor sail down was uneventful but we got to pass some lovely islands. 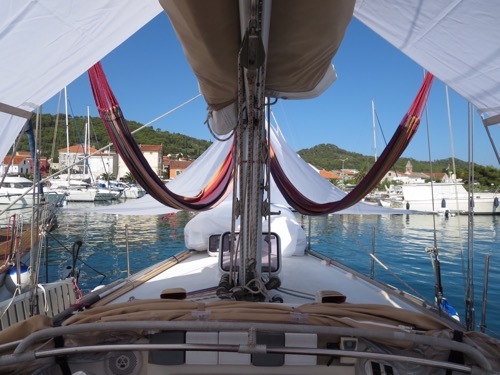 The forecast had also shown some high winds all day Monday so we decided to go into the marina at Preko, which is opposite Zadar and a short (cheap) ferry ride away. I’m glad we did as Monday morning the winds increased and the marina was turning people away who hadn’t booked! Monday was a day of chores – shopping, boat maintenance and fitting our new awnings from Ikea! They really make a difference in a marina when you tend not to get much of a breeze but do get scorching sun. The evening was spent in the lovely company of Rosemary and Ian who have kept their boat in the marina for the last 9 years so they were pumped for inside information on the local area.